It boggles the mind to look at the dirtiest of American cities like New York and calculate the relatively short period of time the baby country of the US has had to accumulate such formidable filth. Conversely, traveling through Europe offers a glimpse into eras long gone by, with so many structures still standing that have survived more centuries than America has even existed. One such place is the restaurant Piwnica Świdnicka, located in Wrocław, the largest city in Western Poland. Piwnica Świdnicka is reportedly the oldest restaurant in all of Europe, having opened “around 1273.” When we’re discussing actual medieval times, we have to be mindful of the fact that there is not always accurate record-keeping that we can access today like it was saved on an external hard drive. Still, there is documentation to date Piwnica Świdnicka back to that time, and what’s even more remarkable is that the building doesn’t exist today as a broken-down shell, museum piece, or dusty relic, but rather a robust, fully functioning restaurant that’s bustling with diners like it was nearly a century ago. The restaurant is located in the Market Square, in the basement of the Old Town Hall. Its name loosely translates to Świdnicka Cellar, or Beer Cellar, since Świdnicka is a type of barley beer named for the town of the barley’s origin, the Silesian town Świdnica. 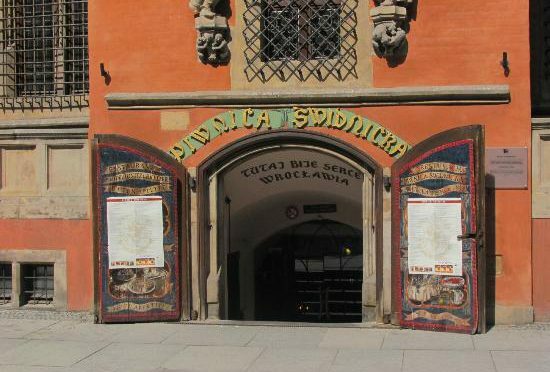 The restaurant was constructed for the noble purpose of ensuring a steady flow of beer production, because the law at the time required distribution of any beer brewed outside of Wroclaw to be regulated by the city council, which could be done conveniently in the basement of the town hall. The cellar was repeatedly renovated and extended to accommodate more guests until the fifteenth century, when it reached its final, current overall shape. In 1519 the cellar’s vestibule was joined with the main tunnel to more easily facilitate rolling barrels from the nearby brewery. After all, that beer is everyone’s main concern, right? Of course a full menu was developed, featuring national culinary treat pierogi, because it’s good to have a nice meal at a restaurant and one needs something in one’s stomach to sop up all that beer. Efforts were made to maintain a decent ambiance and not make Piwnica Świdnicka into a simple beer hall or pub, however. There are existing records from 1731 indicating that such saloon-ish activities as playing cards, smoking, and swearing were banned in the restaurant. Even music was regulated, with an orchestra playing only two nights a week, nothing more. Piwnica Świdnicka has not endured nearly 750 years without suffering, though — no place has. It’s withstood natural disasters and man-made wars, although, luckily, the actions of war did not cause appreciable damage. Still, its facilities shared the fate of other public facilities in the city, succumbing to a large extent of devastation and looting. There were major renovations in 1904 to add electricity, then again in 1936, and yet again in 1960. A terrible flood in 1997 did some damage, but the Old Town landmark was restored once again, and is fully functional as a contemporary restaurant with history in every inch of its 1,700 square meters. And hey, if there happens to be a crack in the foundation or a bit of dirt on the facade, remember that the place is almost 750 years old. It’s earned its dirt.